The Paperback Version Is Now Available!! 3. Your entire alleged wealth is/has been liened, you don’t own anything! You merely have possession by privilege. This privilege may be yanked at any time if you don’t obey the real owner. 4. The Federal Reserve Note is a foreign product owned by a foreign corporation, and not by you or the U.S. government. 5. The States and the United States courts are bankruptcy courts representing the interests and property of the foreign creditor. rights. Hence, you have been insulated from your birthright, the common Law from which your rights are immutable. 7. You are charged an income (excise) tax for transacting in the foreign commodity known as Federal Reserve Notes. 8. You have been divested of the rights to, value of, and profits from your labor, which has been stolen. 9. Lawful gold coin (pre 1933) money transactions are invisible to the states and national government(s). 10. The real cause of draconian governmental regulation and your loss of rights is the toxic currency. 11. The United States lost its sovereignty in 1933. It is in receivership to the hidden creditor. The bankrupt government is a puppet to the real master, as declared by Banker Rothschild on the cover. 12. The real cause of the current economic calamity is the toxic currency. 13. The hidden creditor (international bankers) owns everything, including you. 14. You have been living within an illusion, believing that you are free, but in reality you are owned! With this knowledge comes the singular remedy! 1) Are you one of the millions bewildered by the tumultuous economic meltdown? Are you affected by it? Have you wondered how the government has risen to a level of power over us (from licenses to regulations to taxes) that our forefathers waged the Revolutionary war over? 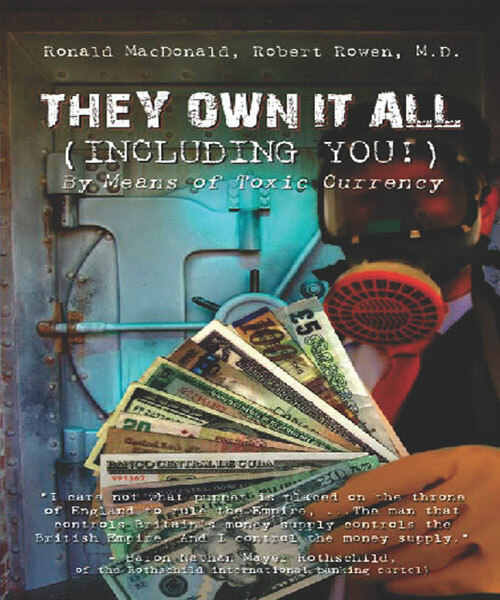 This book connects the dots, many of which you may already know, to show that the singular cause is not toxic mortgages, but toxic currency. 2) This book shows the greatest deception ever perpetrated on the people of the world, and it happened right here in the USA. No it was not Bernie Madoff. His $55 billion swindle was mere childâ€™s play. His was only 1/1,000th that of this swindle we reveal herein. A swindle that has stolen from EVERYONE (including you) in America, without their knowledge. And, it was done through toxic currency. 3) Do you like mysteries? Have you ever been interested in the discoveries of ancient treasures, or new discoveries of hidden wealth or information that has been buried for eons? If so, we know you will enjoy reading They Own It All (Including You!) because it uncovers a hidden secret that affects every one, and everything. It reveals and answers an ancient prophecy that 2,000 years ago predicted what we are experiencing today. 4) We, the authors unequivocally state that this book will shift the reality of everything you have believed regarding the government, money, property, and rights. 5) By reading They Own It All (Including You! ), you will find out what the two scales in the above header mean. Once you understand the two diverse scales above, you can consider that you have awoken to a secret, which has been strategized to steal from you, not only your wealth, but your person. It will remove a veil from your eyes, and more than likely will make you angry, very angry! If you do not want to be angry by learning the truth, we caution you not to read the book, They Own It All (Including You!). 6) Are you concerned about the debt our government has foisted upon each and every man, woman and child for the next thousand years if not forever? We firmly believe and state that the knowledge in this book will offer the people of America a freedom unlike anything they have seen since the War Between the States. We CAN take our country back! 7) You have nothing to lose, and possibly a world of knowledge unlike any other in history to gain. Buy it, and if you don't like it, GET YOUR MONEY BACK! How many times have you in life bought a book and were dissatisfied with the contents? Here's the deal, if you are dissatisfied with the contents of They Own It All (Including You! ), say so. Return the book to us, and we will refund the purchase price. WHAT IS NEW PEOPLE ORDER? New World Order in control. Click on the Links Above to buy the Book Now! We will be constantly revising and updating the book's chapter on remedies as new information arrives. These revisions will be available at no cost to the book readers. Please click here to register to receive updated remedy information from The New People Order.